Zach Cope nails it from 40 yds (his dad thinks he can do it from 50)! Recently, Zach Cope won one free Kèva a week for a year by kicking a longer field goal than the other kontestant. Isaac Pitt from VHS and Willie Barnett from BHS recently had the chance to win one free Kèva a week for a year. Both kicked field goals from the same distance until only one made it. The winning field goal, kicked by Isaac, was good from 40 yards. Meet Miss Bountiful and Davis County! Miss Bountiful – Keva’s Biggest Fan! Teale Shawn Murdock was born in Los Angeles, California to beach and Beatle loving parents! They soon relocated to Utah for the early part of her life before moving around the country for nearly a decade. She loved seeing new places and making lasting friends in states including Florida, Georgia and Texas! Nearly two years ago, Teale and her family finally made it back to Utah and the Salt Lake City area! Teale is proud to come from a family of high moral value, love of music, and the everyday enjoyment of life and the opportunity of tomorrow. Teale has been competing in pageants since she was 14 winning several titles including Miss South Jasper County 2006, Miss Cinderella Teen 2007, Miss Golden Triangle Teen 2007/2008, and finishing in the top 3 at the Miss Texas National American Miss pageant. Last year Teale made it to the top 5 at the Miss Utah USA pageant. She has high hopes for this year’s competition and cannot wait to compete again! Teale would like to thank all her family, friends, coaches, and sponsors for their unlimited love and support! Clegg "the leg" nails a 45 yarder! Thank goodness for the Keva with Keva Gizer! 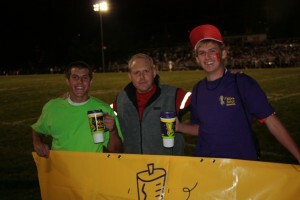 Keva Juice recently sponsored the Bountiful vs. Woods Cross football game, where one lucky kontestant, Matt Clegg, won one free Keva per week for a Year! Be sure to enter in the next drawing for your chance to win upcoming kontests by stopping by Keva Juice today!